You can visit the Apartments Ogrin website without any identification or submission of personal details. However, on some web pages, you are required to enter your personal details, e.g. e-mail address, name, home and office address, phone number and other details, in order for us to execute your request. The exclusive responsibility for the authenticity of personal details and contact information rests with the users themselves. The acquired contact information is used for establishing contact with the user when necessary or when requested by the user. You may cancel your consent for processing your personal details at any time. In this case, Apartments Ogrin will make all necessary arrangements for the immediate execution of your request. 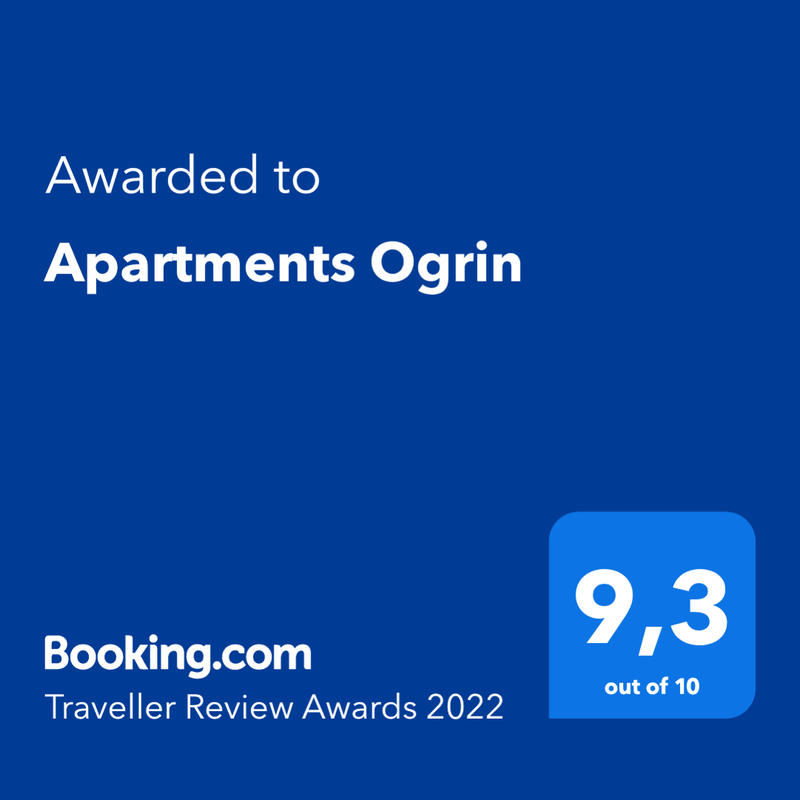 Apartments Ogrin uses your personal details in order to execute your request, as well as for communicating with you: for providing answers to your questions, for submission of notifications, for booking apartment. Personal details and contact information will only be used for the purposes for which they have been submitted, in accordance with your consent. We always notify you in advance of collection of personal details and the purpose thereof. In case of collection or usage for any other purposes than those for which you submitted your personal data, we will contact you regarding the acquisition of your consent. Apartments Ogrin shall not submit the personal details of its users to any other physical or legal entity without their consent. We reserve the right to access and reveal personal data with the purposes of compliance with the law, meeting of legal requirements, use of data in legal proceedings or protecting the rights and property of Apartments Ogrin and our customers. Apartments Ogrin website uses "cookies" that enable the user to display and use our web pages in accordance with their personal settings. A cookie is a small text file stored on your computer's hard disk by the web server. Its main purpose is to store your settings and other data to your computer, so it's not necessary to re-enter it upon the next visit to the same web page. Apartments Ogrin website also collects data on your usage of our website and online services. With our tool for website analysis, we may, for example, acquire information from your browser about the website from which you reached our website, the browser and keywords that you used to find us, the pages you viewed on our website, the data you viewed, or the screen width and height of your browser. With various tracking technologies, we may acquire information about the web pages you viewed, the links that you clicked and other actions that you performed on our web pages. In addition, we collect the usual information sent by the browser to every visited website, e.g. IP address, type and language of the browser, time of accessing and website addresses. The Privacy Statement was last updated in August 2018. This Statement may be occasionally updated in accordance with the modifications of our services as well as on the basis of feedback from the users. Any modification of the Privacy Statement will be published on this site and the date of the last modification will be posted. In case of substantial modifications, we will notify you either by placing a visible notice on our website.